Jazz Keys showcases the next step in Touch Loops' 'elements series'. A collection of small but focused packs offering the finest moments of a single beautiful idea. 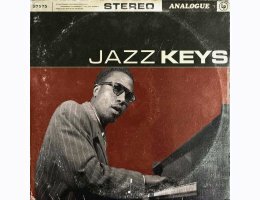 This weeks addition comes in the form of a beautifully recorded, sample ready jazz piano loops collection. Performed and recorded by the outrageously talented session pianist Jakob Lindhagen, this truly authentic collection of jazz piano samples are the perfect addition to any composers sample library. From complex jazz chords to delicate lead lines and phrases we've covered a lot of ground to provide you with the ultimate in flexibility & inspiration. Focusing each recording session on tone, mic placement and performance, we've purposefully included those personal moments that make this collection so intimate and endearing. From breath sounds and wooden creaks to sounds of the actual piano hammers striking the strings, this stunning collection brings you an up front and personal set of recordings that are as beautiful as they are delicate. So, if you are looking to add some beautifully recorded jazz elements to your sessions then this ones for you. Perfect for breaking out of any creative blocks, expanding your chord and key choices or adding that authentic live performance element this collection is mix ready, royalty free and good to go.